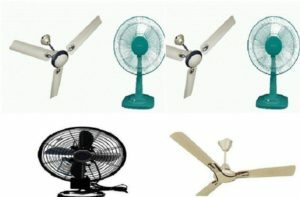 In this article will discuss about the difference between table fan and ceiling fan. we will also know about working of table fan and ceiling fan. Difference between Table fan and Ceiling fan. Table fan and Ceiling fan working are describe below . both fan are have measure difference which we have discuss in below article. In table fan a single phase induction motor is used. This is the main part of table fan. A capacitor is used to give starting torque to the motor , it gives power to start and run the motor. When electric current is start to flow in coil of motor , a magnetic field is created and a force is generated in clockwise direction and Motor Starts to run. it is very similar to the working of table fan.The ceiling fan has a motor that converts electrical energy into mechanical energy. First, the capacitor of the ceiling fan torques up the electric motor, thereby causing it to start and run. As the electrical current reaches the motor, it enters coils of wire that are wrapped around a metal base. When this current passes through the wire, it creates a magnetic field which further exerts force in a clockwise motion. In this way, the electric energy is converted into mechanical energy and causes the motor coils to spin. The blades attached to the motor also start gaining motion with the spinning of the coils. 1) Ceiling fan can cool entire room but table fan can coll in particular direction. 2) Ceiling fan rotate in anti clockwise but table fan rotates in clockwise direction. 3) Efficiency of ceiling fan is greater than table fan. 4) In ceiling fan armature is stationery and motor is in motion but in table fan motor is in stationery and armature is in motion. 5) Table fan is not need to install but ceiling fan require installation by skilled person. Hence these are some basic difference between table fan and ceiling fan if you will find any incorrect in above article you must comment below in comment box.